I call him Clark Kent, and he can turn into Superman on Saturdays and Sundays. He's one of the cleanest players in this draft. 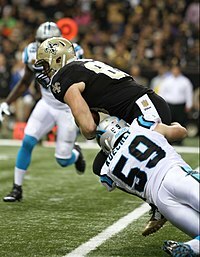 His instincts and his pass-coverage ability might be the best of any linebacker I've seen come out of the draft. I love that when that passion comes out of him, maybe a sprawl or a flex or something like that. But then, off the field? Completely unassuming, we'd walk right by him, and you wouldn't even know he was an NFL player... kind of has that Clark Kent air about him. That's why I call him 'Super Luke'. 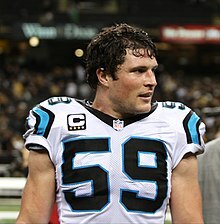 Wikimedia Commons has media related to Luke Kuechly.